7.13 points at 15 votes (rank 318). "Your mission: free Asia, Northamerica and a third continent of your choice. "...stop, wrong game! 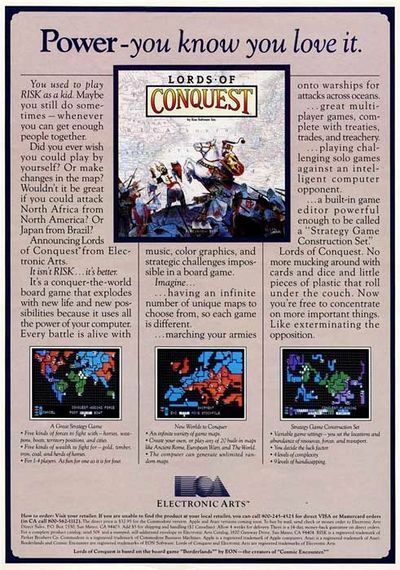 Lords of Conquest is a strategy game by Electronic Arts from 1986, which was first written for the Apple II and then ported to the C64. It is based on the board game "Borderlands" by the English game manufacturer Eon and is designed for either up to four players or a single player against a computer opponent. The one who makes it to build or conquer three towns and keep them at least for one game round is the winner. If several players start to gain control over their third town in the same round, the game will continue until one of them loses a town or builds a fourth town. There is the alternative that you completely eliminate your competitors, but from experience both human players and computer opponent (!) throw in the sponge before it comes to that. 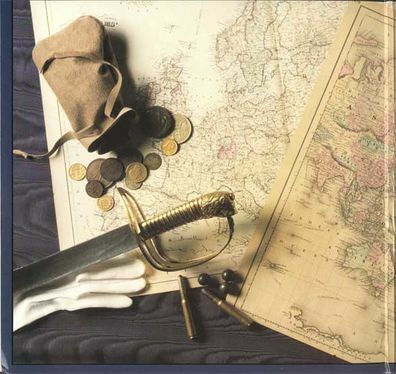 To be able to build and defend the required three towns or, if necessary, to capture the hostile towns, the players need resources (iron, coal, wood, gold and horses), which they can gain from the correspondingly marked provinces of the map and which need to be protected from the graps of the other players. While the game against a single opponent is limited to pure tactics with military units, a game with three or four players has an additional trading phase, in which resources can be swapped / begged / blackmailed. Additionally, the players can side with the attacker or the defender during an attack. With this Lords of Conquest also allows many diplomatic interaction by founding and breaking (short-lived) allies and at the end everyone screams in confusion and goes for each other's throats... the way it should be! 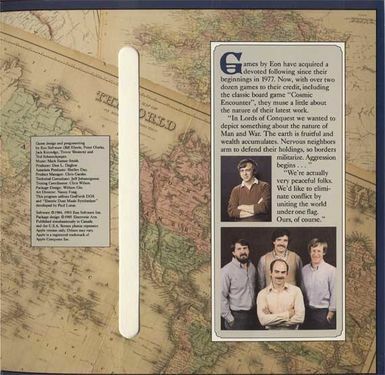 The game comprises twenty ready-made maps (Northamerica, China, Mediterranean area, world etc.) as well as the possibility to get new maps generated or create own maps in the editor. After setting the desired parameters in the options screen (see more in section "Hints" below) you decide on which map the game should take place. Then you have the possiblity to change the positions of the resources on the map. When you are satisfied with the map, the allocation of the land is done, in which the players choose each a province in turns from the map, until none is left. Then the actual game starts. 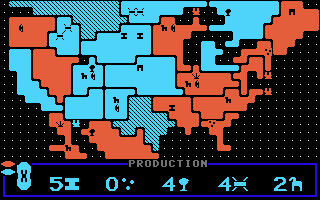 Player orange and player cyan fight about North America. There is a production phase of player cyan going on. Below his collected resources are listed. >From left to right: iron, coal, wood, gold, horses. F: Pawn: Horse, raises the attack and defence force of a province. Can transport a weapon. I: Pawn: Boat, enables you to attack from water surfaces, raises the defence force of a province. Can transport a weapon and/or a horse. "Trade" - only with three or four players! In each phase the players take an action one after the other. The order of the players is newly decided at the start of every round. Between the phases you can enter a menu by pressing the fire button, in which you can make some settings or save the game. Each province with a resource symbol generates a corresponding resource. All resources go into the "Stockpile" of the player until the development phase at the end of the round starts. This stock is located in a province chosen by the player after the first production round and can be changed later. If this province is conquered by an opponent, he will loot all the collected resources, which is equal to a catastrophe and is most of the time decisive for the game. Therefore, the position for the stockpile must be chosen wisely. Horse resource is a special case: Horses do not go to the stockpile of the player, but spread on the map. If a horse is already in a horse resource province, another horse is then "born" in a randomly chosen adjacent province. This happens until all coherent provinces of the player are equipped with horses and there is no space left. The players have now the possibility to trade with resources. You can try to get things that you lack by swapping and maybe add authority to your demands with threats or try to curry favour with the opponent by giving gifts. Of course inflated exchange rates are a daily occurence with such transactions similar to the classic trading simulation M.U.L.E.. You should only beware that your nice neighbour not just simply marches over the border to take with violence the things that you do not want to give him. The player has the possibility to either move his stockpile to a new province or move either a horse, a weapon or a boat from one province to a neighbouring province. Horses can now pick up weapons and move them along to two fields. Boats can carry a horse and/or a weapon and move as far as a water connection to the destination exists. Player cyan tries to steal a province with a gold resource from player orange. Three provinces adjoin a hostile province, which makes 3 force points. The attacked province has only one force point and one neighbour for another point, which is together 2. The attack will be successful. Here the player cyan however, bangs his head against a brick wall: only three own provinces border the destination province. But the enemy owns two neighbouring provinces which both are equipped with a horse. So he has 1+2(for neighbouring province)+2(for the two horses)=5 force points, i.e. the attack will fail. Every player has up to two attacks onto hostile neighbouring provinces. If the first attack is successful, he can then either make a second attack or move his stockpile into another province. But if the first attack fails, this phase ends prematurely. Hostile horses, weapon and boats in a conquered province are also conquered and change sides. With Plan Attack you mark the start of the attack and choose the destination province, whereupon the game shows the forces of attacker and defender. If the own strength is enough for an attack, the menu point "Attack" appears and the attack is either successful or warded off. If the own forces are not enough you can bring up one of your own horses or one boat by choosing "bring forces". Horses can be brought up from a distance of up to two fields to the attacked province and also bring a weapon with "pick up weapon". Boats can even be brought up from any distance, as long as they can reach the coast of the destination province. Boats can also bring a horse and/or a weapon with "pick up...". If the forces are still not enough or you have changed your mind, you choose "Replan" and can look for a different aim. If you lose a battle, all your units (horses, boats, weapons) that were brought up per "bring forces" are DESTROYED! Each own province, that borders the enemy province contributes 1 force point. Each horse in provinces, that border the enemy province contributes 1 force point. Each town in provinces, that border the enemy province contributes 2 force point. Each weapon in provinces, that border the enemy province contributes 3 force point. The attacked province itself contributes 1 force point. Each own neighbouring province contributes 1 force point. A horse in the attacked province or on an own neighbouring province contributes 1 force point. A town in the attacked province or a neighbouring province contributes 2 force points. A weapon in the attacked province or a neighbouring province contributes 3 force points. A boat in the attacked province contributes 2 force points. The defender CANNOT bring up additional force points! The whole thing sounds utterly complicated, but it is not, as the game immediately calculates the forces for you as soon as you start an attack. If you want to know the forces of unreachable provinces you choose the menu point "Info" and then "Force count". If a a player attacks another player all the other players that own neighbouring provinces next to the attacked province are asked if they want to help the attacker or the defender. Same as in the trading phase you also have to try to draw the co-players on your side by using diplomacy (eg. lying, threats, (ir)rational appeal, pithy talks, foot kicks, depriving of love, etc.) to get off well in this issue. In this game player cyan has afforded two towns (dashed) and with this doubled the number of gold and iron resources of the neighbouring provinces at the upper left of the screen. The wood and iron resources of the neighbourin province of the town in the lower part of the screen are not doubled as they belong to player orange. The resources gathered in the production phase can now be used to build towns, weapons or boats. Horses do not get build, they multiply as described above during the production phase by themselves if a corresponding province is available. a weapon costs 1x iron and 1x coal and raises the attack and defence force of the province in which it is located as well as all bordering provinces by 3 points. a town costs 1x iron, 1x coal, 1x wood and 1x gold and raises the attack and defence force of the province in which it is located as well as all bordering provinces by 2 points. Additionally, a town doubles the resource symbols in the own province as well as in all bordering provinces of the player. The one who makes it to build three towns and keep them for one round wins the game! Provinces with towns are shown in dashed. a boat costs 3x wood, has an attack and defence force of 2 and can be used for attacks over water surfaces. Additionally a boat can also carry a horse (force 1) and/or a weapon (force 3) for a combined attack force of up to 6 points. Special case of the resource gold: if a player lacks resources to finish a certain building project, he can use gold alternatively. A weapon costs 2x gold, a boat 3x gold and a town 4x gold. The unwritten law, that a wargame needs to look plain was also abided consequently in Lords of Conquest. 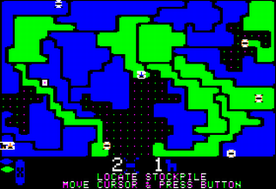 That they did have the courage to release a commercial game with this mixture of charactersets and symbols on a downright stone-age niveau in 1986, must stem from the consent prevailing at that time, that the typical war game player would brake down due to stimulus satiation when looking at coloured high-resolution graphics. However, the clarity profits from this minimalism and thus the situation can be comprehended fast after a short familiarization. The sound can be noticed rather quickly as unpleasant - if one forgets to switch it off in the main menu - with repeating jingles when setting up a pawn or conquering a land. And even if you switch it off, you get faced with a DADADADAAAAA! from Beethoven's Symphony No. 5 with each move by the computer and at the end of the game even with a bearable version of the prelude and fugue no. 1 C-major, BMV846 (Video at YouTube ) from the "Well-Tempered Clavier" by Bach, if you want or not. Player orange wants to annoy player cyan, but the attack force is not enough. With the command bring forces, however, he could bring a horse from the northern neighbouring province and would then also have 4 points with which the attack could be successful. Player cyan counters by building a town on the threatened field. At the same time, he has gained another horse in a neighbouring province during the last production phase. His defence force is now so high, that orange has no chance even with bringing up his horse. Player orange finds a solution: by conquering the neighbouring province, he reduceds the defence force of cyan by 1 and at the same time gets one force point by another bordering province and the horse. Now both are with equal strength and the attack at the town could succeed. In more complex situations the computer opponent can well need up to two minutes for the calculation of his move (that is what the manual says, but it seems that it can take even longer). If you do not want to wait, you can try to abort the calculation of the move by a press on the fire button. This sometimes works better or worse and according to the manual, the AI takes the move that it has calculated after 10 seconds anyway. The game level decides about the complexity of the game. The features described above can only be found in the whole in the EXPERT level. The lower levels have limitations. Beginner: There are only two resources: horses and gold and boats cannot be build. In the transport phase you can only move your stockpile. Intermediate: There are all the five resources but no boats can be build. In the transport phase you can only move your stockpile. Advanced: There are all the five resources and boats can be build. In the transport phase you can only move your stockpile. Expert: The complete game with all resources, boats and a transport phase in which you can also move horses, weapons and boats. The more luck is in the game, the less predictable it gets and the more careful you need to act. The loss of a production phase or the failure of a attack thought to be successful can easily cost you the victory. On the other hand, one can turn around hopeless situations by pure luck. Low: Every attack in which the attacker has at least the same forces as the defender is automatically successful. Attacks at a stronger defender are impossible. The computer plays best with this setting and the game needs utter concentration. Medium: Every attack in which the attacker has more forces than the defender is automatically successful. Attacks at a stronger defender are impossible. When both have the same strength, the winner is selected by lottery. Production, trading and transport phases can fall out. This level can be chosen if you want to have a surprise every now and then (no matter if good or bad). The computer opponent plays equally good or bad on all levels, with this you can only set a handicap for the start for one side or the other, this is who is allowed to choose the first province, who has the first attack and how many extra provinces one gets. It can happen, that the AI recognizes its desperate situation and draws back from the game with a more or less stroppy comment. 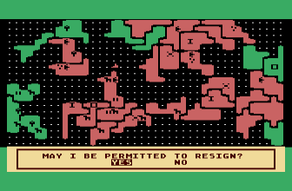 This is of course always a cause for joy ("YAY, I have outsmarted an 8bit game!") and along the way the sayings that you can read then are quite funny. The four fight about Europe: While George (green) tries to steal the alps from Franz-Josef (yellow) and already threatens with his horse, Willy (cyan) hesitates with his decision, as he does not grant the province either of both. Nickie (orange) watches amused...but for how long? The war already starts with the allocation of the land at the start of the game. Provinces with resources are of course in great demand, especially iron and coal to build weapons and horses as they rise the forces for fights and reproduce themselves. On maps with much water wood can get extremely important to conduct surprise attacks with boats. Such a wild boat loaded with a weapon and a horse has after all a force of 6! Choosing provinces that lie crisscross scattered over the map during the allocation of the land are not much use, they are hard to defend due to little coherence and they can only execute little attack force. If you keep your provinces close together and at the same time surround hostile lands with them, you can create the basis for a solid emplacement with the first moves most of the time. A coherent lump of provinces without resources in them is, however, also mostly senseless. If you have the choice of either building a town or a weapon, you need to deliberate about whether the raised production is worth it or if one can better gain the resources by force. If you can enhance two or more resource provinces by buildung a town - best with different resources - this is most of the time a very good strategy. The own stockpile must be protected from access by the enemy, best in a province which is as strong as possible, i.e. which has many neighbouring provinces. If this is not possible, you should try to put the stockpile on a deserted island, at least as long as there are no boats in the game. Losing the stockpile is most of the time the player's doom, "unless" he can re-conquer it in the same move or he can conquer a third town to win the game. If a hostile province cannot be gained at first go, you should try to isolate it from as many neighbouring provinces as possible, in which you then send new troops (horses with weapons). As the order of the players rotates and everybody is in turns first or second, one can plan ahead. E.g. in every two-player game its every player's turn twice. Robotron2084: "A really great strategy game, which is racked with daunting graphics but is incredibly fun. The computer opponent is programmed diabolically well and poses a very sophisticated enemy in the higher difficulty levels which can cause you very painful defeats when you think that you have already won the game. This is by far the best and most equitable AI that I have ever seen on the C64 - except for some chess programs. The replay value is enormous due to the random generation of maps and manifold options at the start of the game and there is really no game the same as the other. With human opponents the game gets an additional dimension with the trading phases and the possibility to intervene the wars of two other opponents. 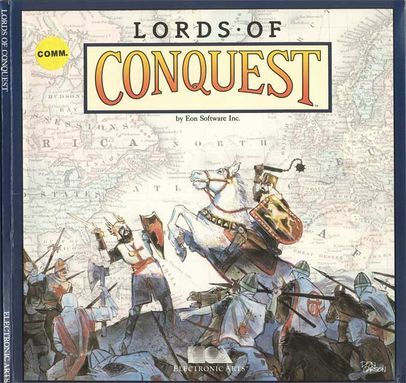 We loved to play Lords of Conquest often in the clique and carried out the worst intrigues, which not seldem ended in mad (and very funny) negotiations. You have to imagine a game like M.U.L.E. 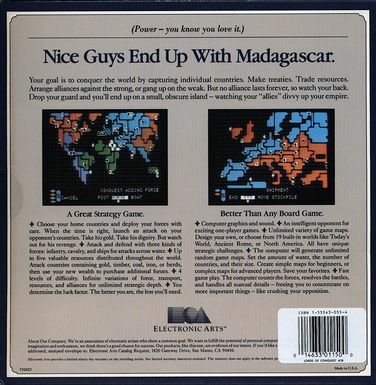 with a military option, the temper that rises during the end phase is at least equivalent if not meaner, as it does not say "nice guys end up with Madagascar" for nothing on the package. Clearly an absolute highlight and for me an exemplar for a brilliantly thought-out strategy game with first-class qualities in the mulitplayer mode. The single player mode cannot reach that, but it is worth 9 out of 10 points from me." Blubarju: "An easily accessible strategy game, which nevertheless needs much concentration and thinking. The presentation is okay for such a game and also the computer plays not bad. Solo players get their money's worth imo. But I am surprised about the only average voting on c64games.de. From me this hit gets full 9 points." None of the so far known cracks from the 1980s fixed a copy protection that leads to deleting parts of the charset. Fixed in the Cyberpunx Version from 1996 which is therefore recommendable. The game plan of the original board game can be found in the map menu under "Borderlands". 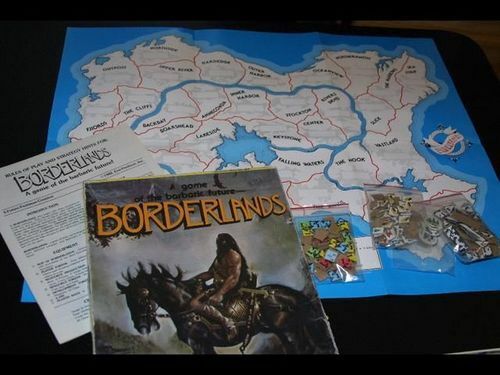 The board game Borderlands which served as a basis for Lords of Conquest. This page was last modified on 3 December 2015, at 18:28.